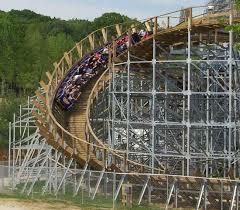 Holiday World announced a new coaster, The Thunderbird which will be the park’s first major steel roller coaster. A computer-generated video showed the unfurling of what would be Holiday World’s first major steel coaster. The wing coaster extends two sets of seats off the sides of the tracks. The wing coaster design was first constructed by Bolliger & Mabillard at Italian theme park Gardaland in 2011. According to a press release, this will be the nation’s first launched wing coaster. The release says the ride will feature a zero-to-60 miles-per-hour launch in 3.5 seconds, with several inversion, including a 14-story Immelmann loop – which features an inversion through a banked turn – a Zero-g roll, barrel roll, and a loop that will rise 125 feet in the air. The coaster will be part of the Thanksgiving section of the park, which is also home to the Voyager roller coaster already. The Thunderbird’s $22 million cost doubles the amount of any other ride at Holiday World & Splashin’ Safari. This theme park is as down home as it gets. Currently, Holiday World is home to one of the top wooden coasters, The Voyage as well as the massive Mammoth a “water” coaster. The Voyage is an air-time machine, with riders experiencing a feeling of weightlessness for a total of 24.3 seconds. This extreme ride takes the traditional out-and-back layout to the edge of insanity, with one of the steepest drops on any wooden roller coaster in the world. The Voyage is 1.2 miles long, placing it among the planet’s top three longest and fastest wooden coasters. The Voyage also has three sections of extreme, 90-degree banking. We carved out five underground tunnels for The Voyage, which is a world record. And some of those tunnels are wide enough that we roar through them twice, creating a total of eight “underground moments,” one of which includes an unforgettable “triple-down” feature. The history of the nation’s first theme park is the story of a family which has, for seven decades, dedicated itself to providing millions of guests with good, old-fashioned family fun. Evansville, Ind., industrialist Louis J. Koch created the world’s first theme park as a retirement project. He was troubled that the tiny hamlet of Santa Claus, Ind., was visited by children who were disappointed when they discovered Santa was not there. With nine children of his own, Koch loved children, holidays and celebrations. Santa Claus Land opened August 3, 1946; the theme park included a toy shop, toy displays, a restaurant, themed children’s rides, and, of course, Santa. Koch’s son Bill soon became the head of Santa Claus Land. In 1960, Bill married “Santa’s daughter,” Patricia Yellig; he remained active in the family business until his death in 2001. Bill and Pat had five children; the eldest, Will, was the park’s president for more than 20 years until his unexpected death in 2010. His brother Dan was president through 2012. Long-time employee Matt Eckert is now president. Over the decades, Santa Claus Land flourished. Children from across the country came to sit on the real Santa’s knee and whisper their Christmas wishes. Guests included Ronald Reagan, who stopped by in 1955. As the park grew, the Koch family knew Christmas was not the only theming possibility for the park. In 1984, Santa Claus Land expanded to also include Halloween and 4th of July sections, and the park’s name was changed to Holiday World. In 1993, Splashin’ Safari Water Park was added; it now covers nearly 40 acres and features two water coasters and wave pools, a river, family raft rides and water slides, plus several interactive family-waterplay complexes. The park, which was named the nation’s #1 Water Park by USA Today, also offers free sunscreen. Holiday World introduced The Raven wooden roller coaster in 1995; it has been voted one of the world’s top wooden coasters each year since, as has The Legend wooden roller coaster, added in 2000. That year, Holiday World became the first park in the world to provide free, unlimited soft drinks. In 2004, the highly-coveted international Applause Award which honors “foresight, originality and creativity, plus sound business development and profitability,” was presented to Holiday World & Splashin’ Safari, the smallest park to ever receive the award. In 2010, the park’s first water coaster, Wildebeest, opened; it has been voted the #1 Water Park Ride in the World every year since. In 2012, Mammoth, the World’s Longest Water Coaster, opened. A swinging ship ride, the Mayflower, opens in 2014. This entry was posted in Coasters, Theme Parks. Bookmark the permalink.